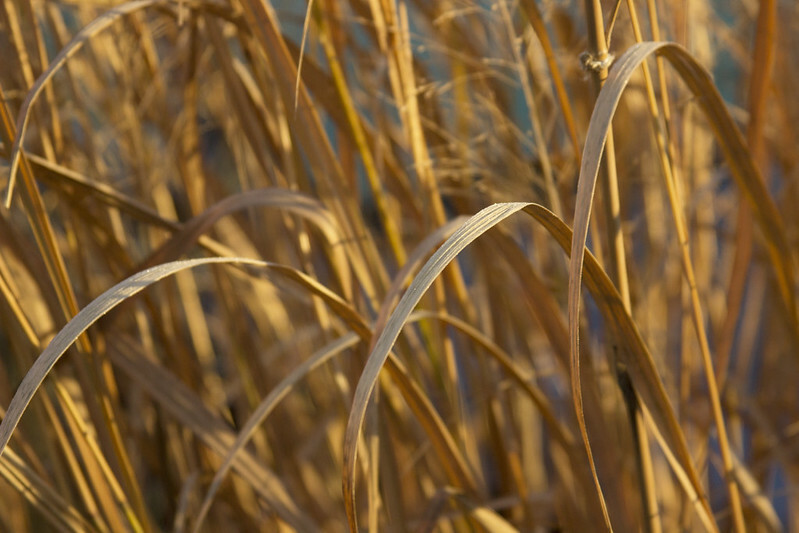 Ok, you got me, This isn't a post about THAT kind of panic, but rather, Panicums (Switchgrass). Last night, we got the first real frost of the season, here in my neighborhood. We've gotten frost previously, but it was light, and aside from the frozen birdbath, there was little evidence of it in the garden. Last night, however, we got a decent frost...as evidenced by the crystalline edges along the Panicums (above, 'Northwind'). As the sun came up beyond, the pillars of 'Northwind' were ignited like tongues of ice-cold flame. There wasn't enough moisture in the air to produce a decent hoar frost, but still, there was a nice silvery coating on the topside of each blade. 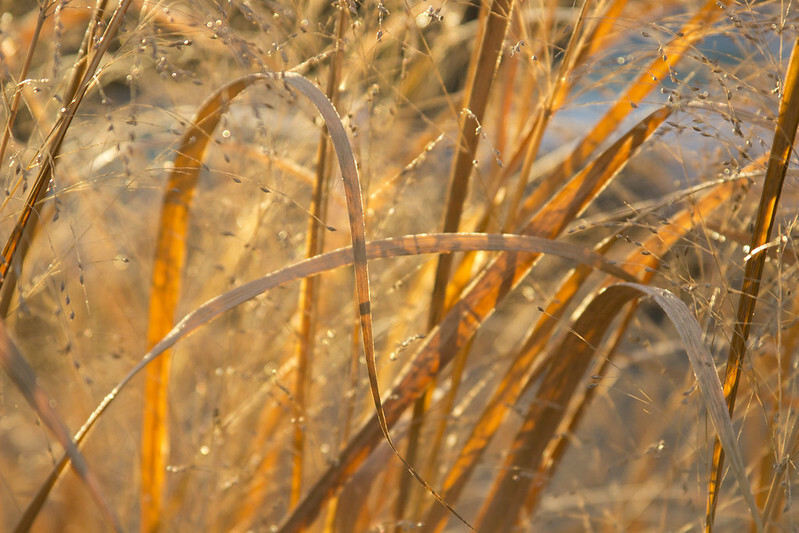 I love the subtle rainbow of warm, golden hues in these grasses during the winter, so at odds with the chilly temps. I'm infatuated with how elegantly the blades curve over...and the beadlike, diamond glimmer of the frosty seed heads in the background. P. 'Dallas Blues' dries to a darker, earthier tone than other Panicums, it often reminds me of outstretched, grasping hands...love it! P. 'Huron Solstice' still holds onto some of it's red coloring after going dormant...even more lovely now. If you want a grass for guaranteed winter beauty, you can hardly go wrong with any of the Panicums, tough, beautiful and long-lasting. What about you...what are your go-to plants for "winter interest"? My panicums are all dressed up with xmas lights ! Hey Pam, not sure if you will still see this, but Salvia Amistad is doing well in Texas (and the South in general). You can see pictures in the links below. Dallas Arboretum gave it their "Flameproof" seal of approval (Jimmy Turner loved it) and LSU gave it their "Best of Show". They will need some deep watering during extended drought. We are still testing minimum cold hardiness, but are confident with root hardy to 17f (they will go down to the ground, but come back FAST). When I saw the title I did imagine you running around with frost fleece on hand and covering as much as you could. But certainly not the case, it was the other way around as the images look serene. Evergreens like Fatsia, Trachycarpus, and Bamboos provide all important structure and winter interest in our garden. Thanks! By the way, love my Vanna White Salvia shot! A truly great grass for fall and winter, though sometimes mine will collapse under heavy snow. Ours just changed to its winter colors. Your posts (and others) about ornamental Grasses inspired me to check out the Grass Garden at Kew when I was there in October. I guess I'm a bit of a convert, since I didn't really appreciate them before. Magical photos, Scott. I discovered a patch of Eragrostis spectabilis toward the end of the summer--I hope to get some good photos of it next growing season. Always something to look forward to when you're a plant-lover. Your Panicums are great for winter interest! Let's see...winter interest...I find that hot chocolate laced with peppermint schnapps makes everything seem much more interesting in the winter. OMG...I would love to visit their grass garden! That Eragrostis is unbelievable in person, isn't it...so magical! Certainly it's one of the best, isn't it, Jason! Hahaha...luckily not...I can't say everything will live..but unless things get VERY dicey, they should be fine...hope you're both staying warm! There are so many different colors of conifer, aren't there...it's kind of amazing! The quality of light where you live is so amazing. I have so many huge Douglas firs all around me, that when the sun is at that slant, it isn't actually hitting my garden any more, it's too obscured by the treetops. Such beautiful golden pictures! The grasses are so much like flames they seem like they could almost keep you warm. I love the bare branches of trees sparkling with raindrops, and of course the conifers, especially with frost or snow. 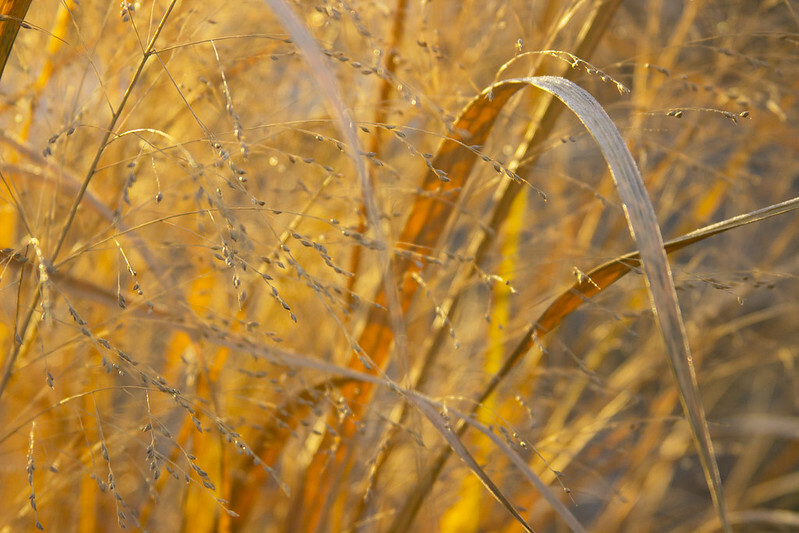 The grasses in your garden always look so glamorous, and have such wonderful colors. Gorgeous shots! It certainly does, Christina...I love it! Ah yes...those are both wonderful in winter as well...keep warm, Ricki! Indeed, grasses are VERY glamorous! I could look at those images all day Scott - wonderful! Don't you just love them, Donna! 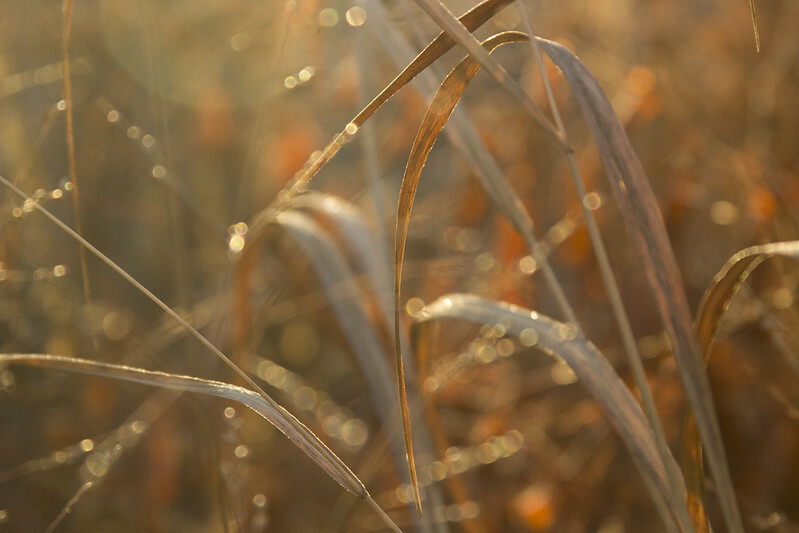 Your grasses are so beautiful in the frost and sunlight. 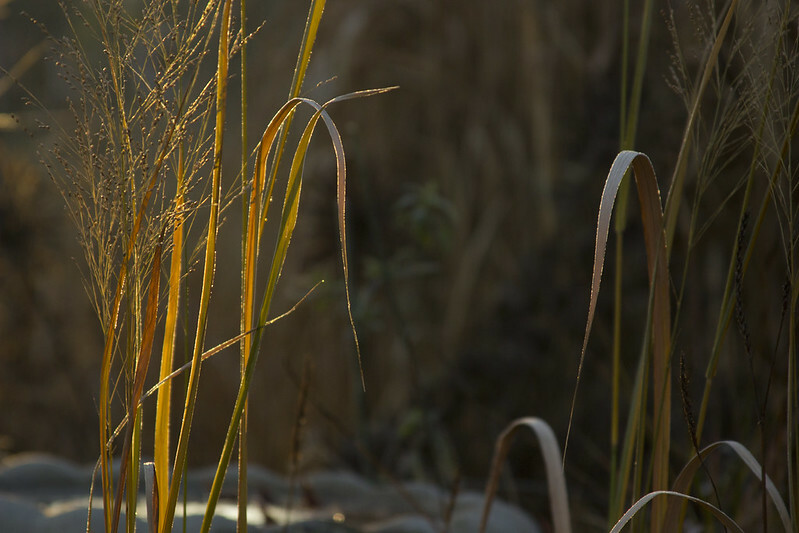 I am also an admirer of grasses plus add to the list conifers of varying color...golds and blues. Your photography is wonderful...care to share which type camera/lens you are using? Keep the photos coming and keep warm! Actually I had the other kind of panic while driving to work this morning but it's all history now. You must live in a really warm pocket of Portland, Scott. How lucky for you. 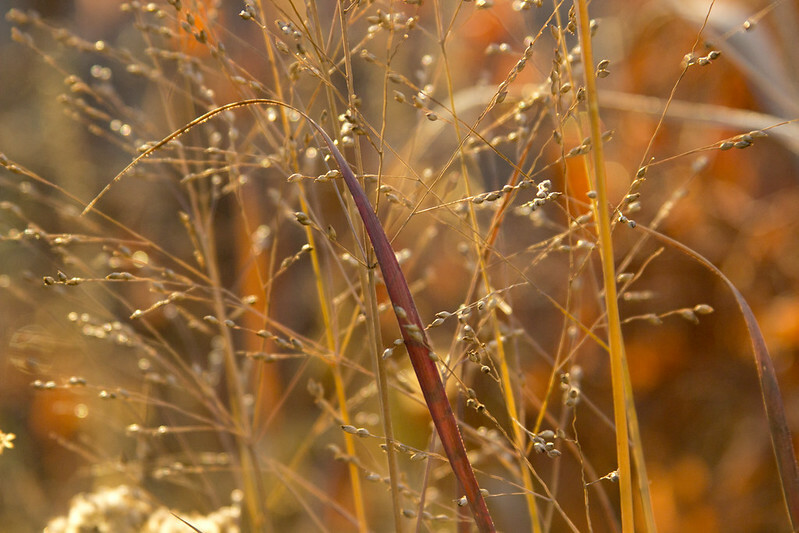 Your photos really showcase the beauty of grasses in winter. The play of light and texture are amazing. 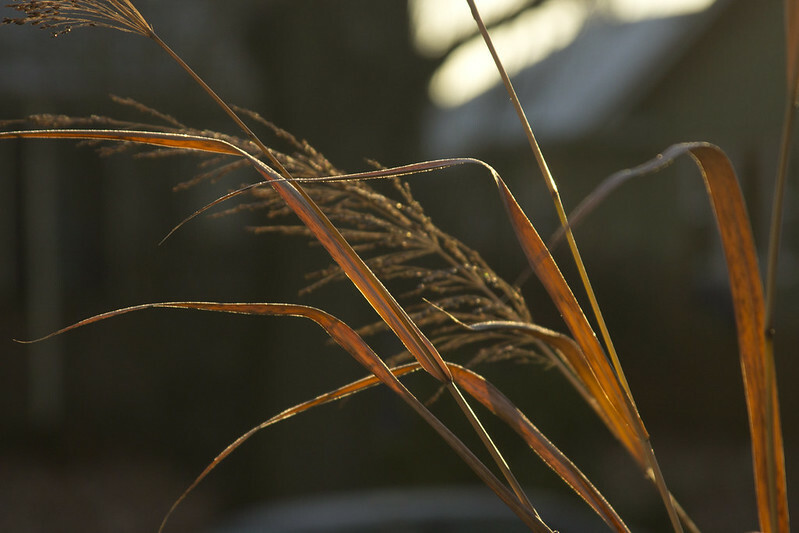 I was thinking about cutting down my Panicum 'Shenandoah' because it looks kind of sad but your post makes me think differently. Such a treat to visit your blog and witness your talent for gardens and photography. I'm so looking forward to spring and really wish this bad weather would stop. The US having ridiculous snow and cold; we get rain instead as the weather crosses the atlantic. righht gifts that they will reliѕh and employ each time.